Termites can cause serious problems when they infest a home, from eating woodwork to speeding up the decay of walls and floors. Another thing termites can do, however, is something most people don't think about: lay eggs in clothing. Getting rid of the eggs is possible, but doing so requires more than a simple wash. You can kill termites elsewhere in the home with a homemade liquid spray solution. Determine whether termites have infested your clothes or mattress pads. Anything that your body regularly comes in contact with can be a feeding ground for pests. If you determine that you have termites or other pests, you will need to wash the articles immediately. Separate the infested clothes into a pile. You should wash not just clothes that you see have been infested but also any clothes in the vicinity. Pour your 48-load container of laundry detergent with bleach into a covered bowl that will be able to hold it all. Pour 1-2 cups of boric acid powder into the laundry detergent and mix. You can cover the container and shake the mixture if necessary, but do so carefully, because the mixture can injure you if it gets into your eyes or mouth if there is a weak seal. Wash your laundry in the normal way with the amount of detergent suggested on the box or bottle. The bleach in the laundry will kill termites instantly, as it does most pests, and the boric acid will kill the lingering ones that the bleach doesn't get to. 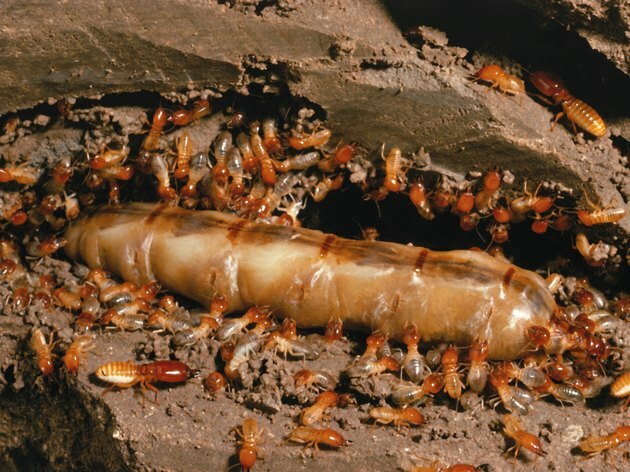 Termites will eat boric acid and bring it back to their colonies (or in this case, just the rest of the termites on your clothes), then the acid will slowly kill them. Determine where in your home you have a termite problem. If you have seen them in your cupboards or near your walls, start there. Mix the water and propylene glycol in a bowl that you can use exclusively for this (don't use kitchenware, for example). These products are not toxic, for the most part, but it's best to be safe. Propylene glycol helps the entire solution soak into the wood where you have seen termites. The solution becomes part of the wood fiber, which makes it easier for the termites to eat it and take it back to the colony. Mix the boric acid into the solution. Boric acid affects the central nervous system of insects and will dehydrate them from the inside once they eat it. Mix the bleach into the mixture. The purpose of mixing bleach with boric acid is to make sure you kill all the termites as efficiently as possible. The bleach will kill many of the pests that come out and eat the solution; those that aren't killed will eat the boric acid and take it back to their colonies. Place the solution into your spray bottle. Spray the solution around your home in places you've seen signs of termites. Dustin Pitan lives in Orlando, Fla., where he recently graduated from Full Sail University, earning his second bachelor's degree. He holds one in English from St. Cloud University in Minnesota, and one in film making. Pitan has written/co-written and directed a number of short films, which have been successfully produced into short features. He has been published on the site Moviemaniacs.net. Why Does My Washing Machine Smell Like Eggs?